It looks like Weekend Update is moving to week nights. The funny and suave Seth Meyers has been tapped to take over for Jimmy Fallon on Late Night. Meyers has been a Saturday Night Live head writer for eight seasons and cast member for 12. He’s manned the Weekend Update desk since Tina Fey and Jimmy Fallon departed from the show. Now, he’s taking over for Fallon once more. Jimmy Fallon will be heading over the the Tonight Show desk in 2014. 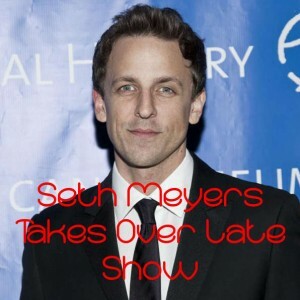 Is Seth Meyers a Good Choice For Late Night? Meyers’ uncensored standup is drop dead hilarious and smart. It’s almost certain that his late night show will have as many loyal followers as Conan O’Brien. Let’s just hope that this new late night show shuffle sticks. The last time we had a shake up, Jay Leno decided he didn’t really want to leave and Conan O’Brien was thrown out. Should the same happen to Fallon and Meyers, younger fans might just have to put their foot down. Barring anymore casting and contract snafus, Seth Meyers is going to make an excellent addition to the late night circuit.